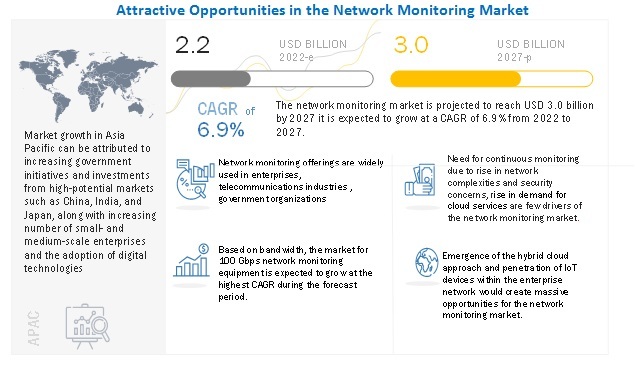 [125 Pages Report] The overall network monitoring market is expected to reach from USD 1.67 billion in 2017 to USD 2.93 billion by 2023, at a CAGR of 9.9% during the forecast period. The base year considered for the study is 2017, and the market size forecast is given for the period from 2018 to 2023. The increasing number of enterprises with strict reliability requirements drives the need for network performance monitoring equipment. Network architecture is growing in complexity and application delivery is becoming more time-sensitive. This demands the need for highly reliable, scalable network monitoring equipment. The need for robust network monitoring capabilities to ensure smooth operations of mission-critical network infrastructure and the need to quickly resolve downtime issues drive the growth of the network monitoring equipment market. Network monitoring helps to minimize the company’s downtime, and thus reduces costs. It is also essential to increase the overall productivity of the network. The network equipment provider companies are trying to create a fully redundant network from end to end; however, in many cases, this is not possible. This may be because of the limitations in the architecture, lack of physical redundancy, or budgets that restrict a fully redundant approach. Today’s information-driven organizations face the fundamental challenge of balancing the high availability of business-critical information and maintaining its integrity and security. Continuous monitoring is the process of constantly and persistently monitoring technological assets, vulnerabilities, configurations, and more importantly, the current network events to discover new assets that may be vulnerable, as well as detect anomalies or other suspicious activities. The research methodology used to estimate and forecast the network monitoring market begins with capturing data on key vendor revenues through secondary research such as Hoovers, Bloomberg Business, Factiva, OneSource, Computing Technology Industry Association, Telecommunication Industry Association, Internet Engineering Task Force, Semiconductor Industry Association (SIA), and Fiber Channel Industry Association. The vendor offerings have also been taken into consideration to determine the market segmentation. The bottom-up procedure has been employed to arrive at the overall size of the global network monitoring market from the revenues of the key market players. After arriving at the overall market size, the total market has been split into several segments and subsegments, which have then been verified through primary research by conducting extensive interviews with key people such as CEOs, VPs, directors, and executives. The data triangulation and market breakdown procedures have been employed to complete the overall market engineering process and arrive at the exact statistics for all segments and subsegments. The breakdown of profiles of primary respondents has been depicted in the figure below. Note: “Others” includes sales managers, marketing managers, and product managers. Gigamon (US), NetScout Systems, (NetScout) (US), Ixia (US), VIAVI Solutions (Viavi) (US), APCON (US), and Garland Technology (US) are among the leading companies in the network monitoring market. Also, a few major companies, namely, Broadcom (US), Juniper Networks (US), Big Switch Networks (US), Zenoss (US), Network Critical (UK), Corvil (Ireland), CALIENT Technologies (US), Netgear (US), and Motadata (US) have also been profiled in the report. Where is the overall development of the network monitoring market taking place? Which are the emerging companies in the network monitoring market? 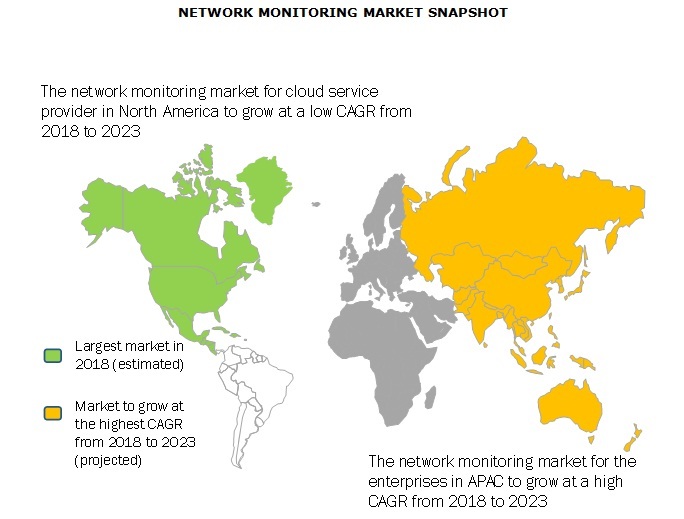 According to the new market research report on the network monitoring market, the market is expected to reach from USD 1.82 billion in 2018 to USD 2.93 billion by 2023, at a CAGR of 9.9% from 2018 to 2023. The increasing number of enterprises with strict reliability requirements drives the need for network performance monitoring equipment. Also, the need for highly reliable, scalable network monitoring equipment for robust network monitoring capabilities to ensure smooth operations of mission-critical network infrastructure contributes to the growth of this market. This report segments the network monitoring market by offering, bandwidth, technology, end user, and geography. Based on offering, the market has been further divided into equipment, solutions & services. The network monitoring market for solutions and services is expected to hold the largest share in 2018. Increased network complexities, converging technologies, and growing implementation of virtualization are expected to transform network management technologies, tools, and practices, and virtual networking installed as part of server virtualization will progressively influence network monitoring. The network monitoring market, by bandwidth, has been segmented into 1 & 10 Gbps, 40 Gbps, and 100 Gbps. The demand for network monitoring is growing worldwide as a result of the ramp-up in the data generated and rapid technological evolution. New technologies include the advent of multi-core servers, server consolidation and virtualization, high-density computing, and IP storage network technologies. The deployment of these technologies and the need to handle data-intensive applications lead to the increasing requirement for network monitoring with high bandwidth. The network monitoring market, by technology, has been segmented into Ethernet, fiber optic, and InfiniBand. Ethernet held the largest share of the market in 2018. The expansion of data center and increase in the adoption of virtualization technology boost the demand for network monitoring equipment with higher bandwidth. Ethernet-based networks deliver more agile and low-latency solutions with increased scalability. However, InfiniBand is expected to grow at the highest CAGR during the forecast period. InfiniBand has grown its market share over the past few years and is now widely used for input and output fabric interconnect in many organizations deploying virtualized or HPC platforms. InfiniBand is primarily used to coordinate server and processing resources to increase the efficiency of storage area networks and servers. North America holds the largest market, and a similar trend is likely to continue owing to the increasing IT capacity requirements and rising adoption of new data center technologies. The market in the US is expected to experience greater traction as a significant number of organizations are likely to opt for cloud services to save their upfront cost of building new data centers for business continuity. The increasing government initiatives and investments from technologically developing countries, such as India, Japan, China, Singapore, and Australia, in APAC are driving the establishment of data centers in the region. Also, the increasing number of small and medium-sized enterprises and growing adoption of digital technologies further drive the demand for network monitoring. Moreover, the increasing penetration of the Internet and growing population of internet users in the region create a huge volume of data, which, in turn, drive the demand for cloud-based services. Network monitoring helps companies in getting clear insights about their network traffic, bandwidth, and operational efficiency, and address all the major challenges such as reducing overall operational cost, identifying optimal routes for interconnecting, and providing accurate insights on the flow of information. However, several free network traffic tools are available in the market space with which network admin can monitor and analyze network traffic and operate the network infrastructure efficiently. Enterprises mostly rely on network monitoring solutions to optimize their network infrastructure on a daily basis. In the digital era, a smooth and agile network infrastructure is of utmost importance for every enterprise to be the frontrunner in the business landscape. Network monitoring solutions help enterprises improve their network performance by examining every aspect of the network process. These solutions are being widely adopted across major verticals due to the increased need for maintaining and optimizing the network infrastructure. Telecommunications systems have rapidly evolved in the last few years with increasing demand for data connectivity. Managing these systems has become tedious not only in infrastructure and functionality managements but also in scope management. With the help of network monitoring, one can keep a track on telecom infrastructure as well as detect hardware failures or discrepancies that can cause potential revenue loss. Nowadays, a vast amount of data is being delivered in electronic format, and government agencies and departments are striving for fast and reliable technology to process their data. The government sector is looking for a secure, reliable, and high-performance network connectivity at a low cost. The network monitoring solutions will help the government sector in rapid disaster recovery from network failure, remote configuration, cybersecurity, and protection of critical network infrastructure from cyberattacks and other adversities. Companies offering network services, infrastructure, and business applications in the cloud are considered cloud service providers. The trends in cloud computing are reaching new heights, with the growing data consumption and increasing mobility. Consumers and enterprises are opting for cloud services for backup and storage, and various other business processes due to increased security and mobility, as well as for cost reduction. Such cloud infrastructure denotes a critical part of business processes for their customers, who benefit from the scalability, elasticity, and security of cloud services. Hence, to keep the complex cloud infrastructure active, this end-user segment has found itself in an increasing need for network monitoring solutions and services. What could be the potential industrial applications of network monitoring? Why it is important to deploy network monitoring software and other equipment is a network infrastructure? Which technology is driving the growth of network monitoring applications?